Here's an unusual style award. Translucent blue and clear acrylic held apart and together by metal pins. Laser engraved or full colour printed. Premier Awards present you with a range of standard designs plus our own exclusive contemporary designs. 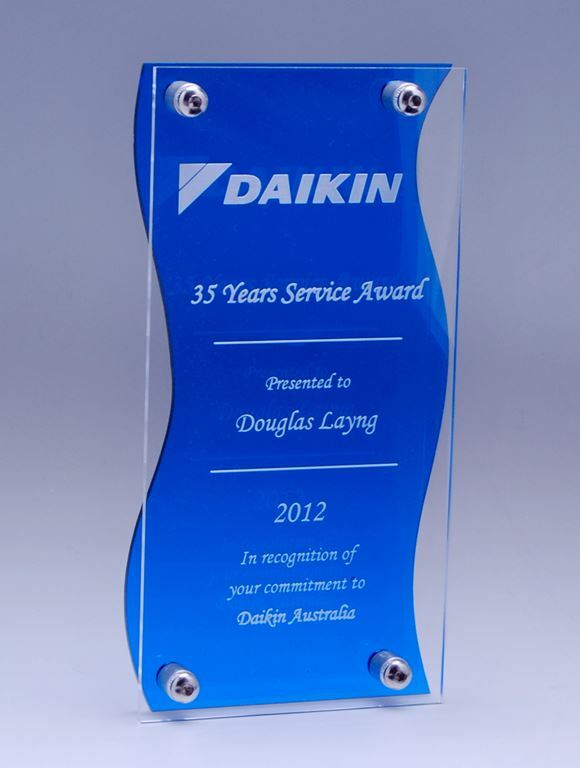 How we imprint your Acrylic Awards. We use high end laser engraving or full colour digital print or a combination of both. Our graphics department want to give you more than logo above text and will strive for innovation by taking elements of your logo to create accent elements, making the award design more alive. You’re not a number here, we take on your project with creative vigor. Just take a look at the examples on our website. 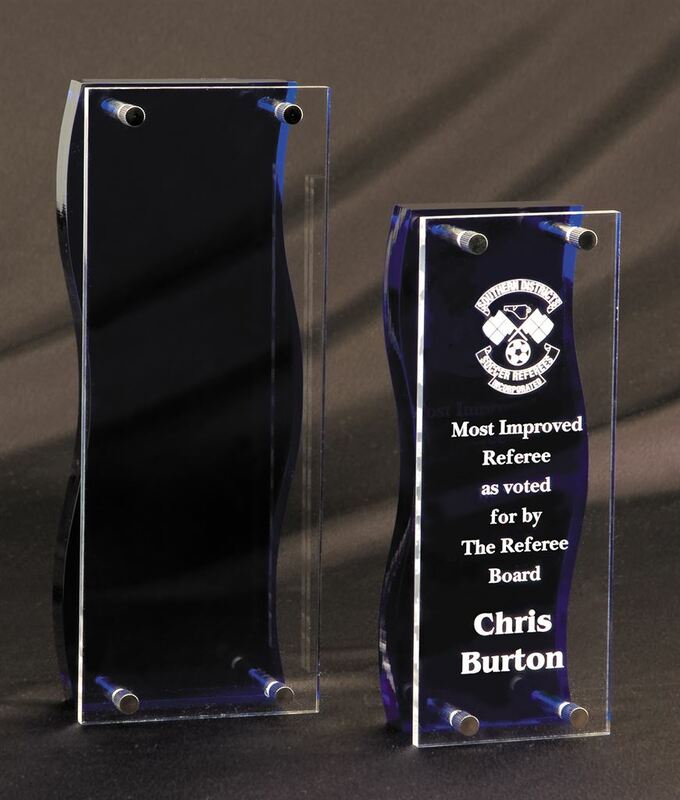 Some of the standard range trophies with an acrylic base can’t be colour printed and are only offered with laser engraving. We mention this on the product page. Well actually we can add colour elements to these trophies if you really want it. For those marked Laser engrave only you’ll have to talk to us and twist our arm to come up with a special colour imprint. Some have lovely presentation boxes, some have plain cardboard boxes and some are provided in foam bags or bubble wrap. For those not in presentation cases we do have some presentation cases which can be purchased if that’s what you want. Check out the optional display cases here. These boxes won’t fit all of the non-boxed Acrylic trophies. We hope they fit yours. We use state of the art laser engraving equipment to expertly laser engrave our products. We can laser engrave any image, logo and text. The pricing for this item is set to include laser engraving. When you select this option we will digitally print some of the imprint and laser engrave other parts. You may like the look of laser engraved finish but want your logo or image in colour. If so this is the option for you.